Oh the Penny. She’s just my ball of love and innocence. She looks at me when I get home with “Where have you been? I have missed you so.” Her only slightly droopy eyes just make me melt. I fight to not let her into bed and to not hug her on the couch while I watch a movie. I know in a year she will be five times the size, and that means I will have no couch room left for myself. Her and Ralph are starting to play together. 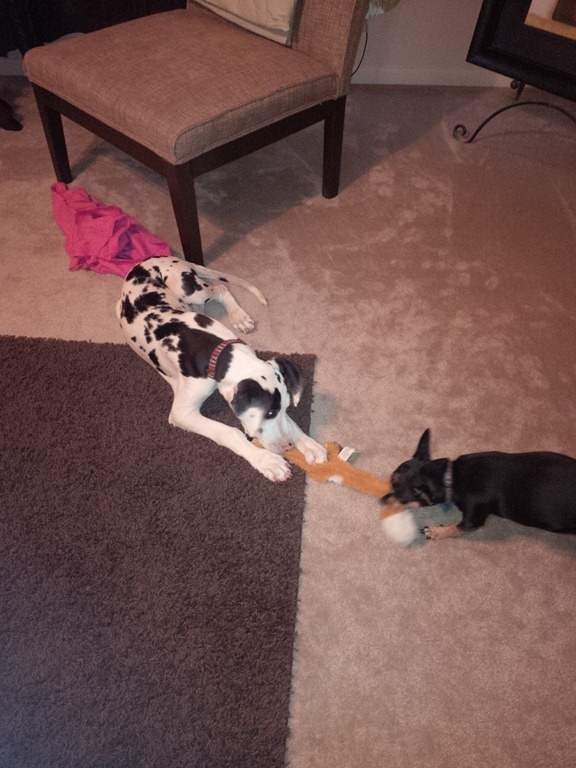 Tug o’ War has become quite a competition in my house after work. I hear good natured “Grr! GrrGrr!” and she generally responds to Ralph with good natured odd noises that I can only explain to be a cross between Chewbacca and a squeaky shoe on linoleum. Very odd. She’s becoming more and more affectionate. We’ve driven to puppy class a few times now and normally she either watches out the window or immediately lays down and chews on the bone I have there for her. 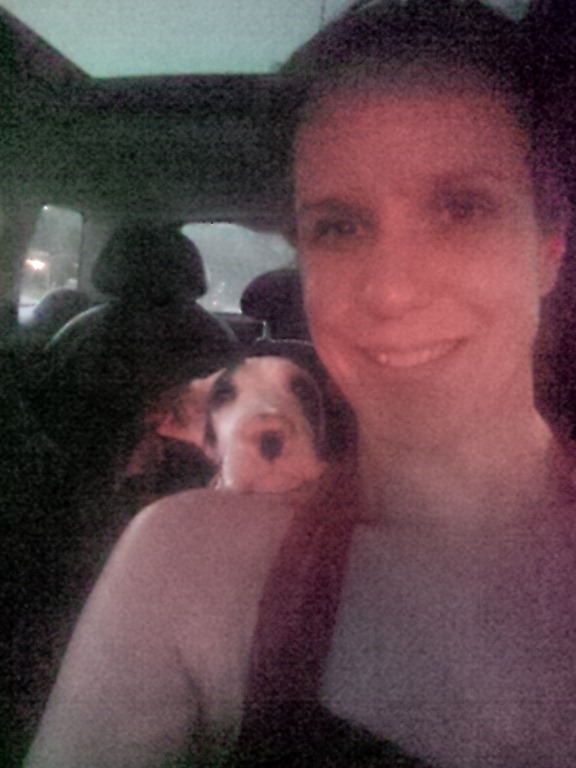 Now she enjoys resting her head on my shoulder as I drive. She doesn’t press or try to get in front, it’s as if she knows we’re trying to be safe! She’s growing, it’s amazing to look down and see a puppy face just getting bigger. I can’t imagine how being a real mom would feel, there’s this nostalgia of “stay small!” but I’m so excited to see her grow and learn new things. She’s just so flippin’ smart. Takes to everything, minus having that puppy attention span of a gnat. Do not be offput by a dog “this size” (as everyone keeps saying “she’s just so. big”) Her intelligence alone already gives her less of a footprint in the house than Ralph. She lays down, she generally stays where the family is, she’s really easy to take care of given how simply blessed I am with her intelligence. Don’t pass these gentle giants by, do not be afraid of size, they have big souls too.